California school districts will finally be able to seek Race to the Top money without interference and resistance from Gov. Jerry Brown and state officials. U.S. Secretary of Education Arne Duncan on Tuesday announced much anticipated draft criteria for a $400 million competition open to individual districts or groups of districts nationwide. That’s enough money to fund a projected 20 proposals for grants of $15 million to $25 million, Duncan said. For districts and qualifying schools in California, this will be the last opportunity to pursue innovative ideas and school models they have not been able to develop in cash-strapped times. The three previous Race to the Top rounds have been open only to states, and California has been shut, although it was one of nine finalists in the second cycle and was all but guaranteed at least $49 million in round three. However, Brown declined to sign the application on behalf of seven districts that put it together, because he believed it would have obligated the state to enact statewide reforms he opposed. As a result, Duncan rejected the state’s application out of hand. That hasn’t discouraged John Deasy, superintendent for Los Angeles Unified, one of the lead districts in the aborted last round. Deasy said Tuesday that the nation’s second largest district certainly will be applying for $25 million. LAUSD’s pilot schools, its new teacher evaluation system, and experiments in other schools are the kinds of reforms that Race to the Top is encouraging, he said. Applications will be due in July; the awards will be announced in October, and money for the grants disbursed in December. LAUSD and the other six Race to the Top districts formed the California Office to Reform Education, or CORE, to continue their work implementing Common Core and teacher evaluation. They also have been encouraging federal education officials to open up Race to the Top to districts. Hilary McLean, director of communications for CORE, said that the superintendents remain intrigued at the possibility and will examine the criteria for applying either singly, as LAUSD intends to do, or collectively. One obvious applicant pool would be districts and charter schools with a widespread use of online and blended learning; the latter is a hybrid that combines classroom instruction and online learning. California has leaders in blended learning: Palo Alto-based Rocketship Education, along with districts (Los Altos School District) and charters (Summit Public Schools) working closely with Mountain View-based Khan Academy on technologies that track individual students’ progress and allow them to learn at their own pace. Among large districts, Riverside Unified, with 43,000 students, is the farthest along in piloting online and blended learning. It also operates the Riverside Virtual School for 12,000 students in and outside the district. Principal David Haglund said that a Race to the Top grant would enable Riverside to take its individualized learning commitment to scale. But Duncan said that new technologies are only one approach to break the “one size fits all mold.” Pointing to the Promise Neighborhoods model of community involvement in schools, Duncan said this could be done by bringing adult tutors into the schools and establishing partnerships with community groups, colleges, and health services to meet the academic, physical, and emotional needs of students. Oakland Unified’s ambitious Community Schools, Thriving Students initiative, which has established partnerships for school health clinics in some schools, with plans for a community STEM concentration in West Oakland, is one effort that could be taken to scale. Deasy said that pilot schools with home visitations and extended-day programs are examples of what the district might choose to expand with a grant. LAUSD hasn’t decided whether to target certain schools or concentrate on select grades. The superintendent, president of the school board, and head of the teachers union all must sign the application. In previous rounds, union leaders’ consent was not required but helped a state’s score. United Teachers Los Angeles didn’t sign off on LAUSD’s previous applications. Deasy said he assumes that the union would not stand in the way of pursuing $25 million for the district. A dozen of the new math tools were featured at the conference, sponsored by Policy Analysis for California Education (PACE), the Silicon Valley Education Foundation, and Mitchell’s NewSchools Venture Fund. (See Kathy Baron’s accompanying story on the renewed debate over Algebra I.) They included everything from engaging games for elementary students to open source digital textbooks and networking platforms for teachers. NewSchools Venture Fund has shifted its funding from charter schools to new technologies that he described as “synergistc innovations that make school systems more effective.” Of the dozen and a half startups that NewSchools funds, Mitchell cited two that have gone farthest in challenging the structure of learning. At the School of One, encompassing three schools in New York City, students work individually on their own “learning map” and don’t attend classes per se. Software algorithms schedule what students learn daily, based on individual needs. It’s a fundamentally different school structure that demands a different approach to teaching. Contrasting the School of One is the force of one, Salman Khan, whose 2,700 instructional YouTube videos in the online library of Khan Academy have gone viral; an estimated 4,000 schools are independently using the videos in the classroom. NewSchools is funding pilot programs in 20 California schools, helping teachers in diverse combinations of schools weave Khan into their curriculum. Because they enable students to progress at their own pace, the videos are changing the nature of teachers’ relationship with students, Mitchell said. 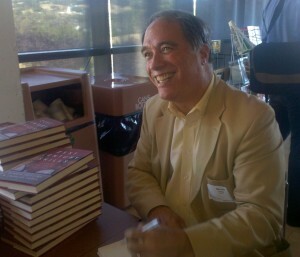 Other conference speakers tempered Mitchell’s enthusiasm with caution while acknowledging technology’s potential impact. Of course, there’s no state money now for computer hardware and new technologies, but Kirst and others expressed optimism that the explosion of software for cell phones and low prices for stripped-down computers, like the Google Chromebooks, will make access cheaper. During his nearly four years at UC Berkeley, Lucas Zucker has gone to great lengths to find affordable textbooks. He shopped online for the best deals and often waited weeks into the semester for the books to arrive from across the country; he shared books with classmates; he bought older editions with identical content that was rearranged; and one semester he didn’t buy some books because they were just too expensive. “I couldn’t imagine what could possibly make any book cost $200,” the senior told members of the Joint Legislative Audit Committee at a hearing Wednesday afternoon. Increases in textbook prices now outpace the rate of fee increases at the University of California and California State University, testified State Auditor Elaine Howle. 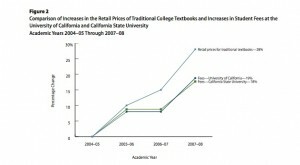 As part of a 2008 report prepared at the committee’s request, Howle’s office surveyed students and found the average price of textbooks represents about 13 percent of the cost of a UC education, 22 percent at Cal State, and 59 percent for community college students – more than they pay for classes. A survey by the consumer group CALPIRG revealed that 70 percent of students found themselves in the same predicament as Zucker and didn’t buy at least one required textbook due to the cost. 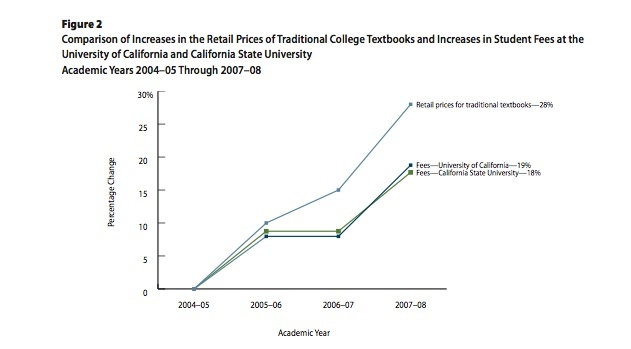 Student fees at UC and CSU rose by about 18 percent from 2004–05 through 2007–08, while the retail price for the textbooks increased by 28 percent. (Source: California Auditor) Click to enlarge. At a time when fees at California’s public colleges and universities are rising faster than an econ major can calculate the rate of inflation, the added burden of spending thousands of dollars on books is the college deal breaker for some students. So the committee focused much of the three-hour hearing on what California is doing to develop free digital texts. A number of companies have already entered the arena, the splashiest being Apple, which last month unveiled its new iBooks 2 digital textbook service for the iPad. It features interactive animation, photos, videos, and other cool tools, but requires cash-strapped schools to buy iPads for every student. Nonprofits and foundations are offering something that’s more within reach. “Access and affordability are integrally linked,” said Barbara Chow, Education Program Director for the William and Flora Hewlett Foundation. She told the panel research has shown that while rental and e-books can reduce costs, “open educational texts are the clear winners,” reducing textbook prices by as much as 80 percent. Chow noted that a number of universities outside California have made significant advances in access and quality of the online materials. Although there is an upfront cost of producing the materials, she said the savings can quickly catch up. An open course library in the state of Washington recouped its start-up costs in the first year. Arizona State University took it a step further. A machine in the bookstore lets students print open source texts for $20, so they have a hard copy to write notes in the margins and highlight passages. In 2008, Hewlett invested $10 million in grants to develop Open Educational Resources (OER), including more than half a million dollars to the Foothill-De Anza Community College District to pilot the Community College Open Textbook Project. It’s now affiliated with more than 200 colleges and conducts peer reviews of open source textbooks and works to raise awareness of the online books among faculty. Even though open source gives faculty more control over their course materials, many have been slow to take to it. “There are real challenges here with this new world of multiple formats,” explained James Postma, chair of the CSU Academic Senate. “Faculty have to play the role of technical troubleshooters. It has changed the job of faculty.” For instance, Postma has to develop correlation guides so students know where to find the reading assignments depending on whether they’re using an iPad, iPod or laptop. In December, State Senate pro Tem Darrell Steinberg made open source a key legislative initiative with a proposal to create Open Educational Resources in California that would give undergraduates free access to fifty core textbooks, and let them buy printed copies for about $20. He said the legislation would save students nearly $1,000 a year. [Click here to watch a YouTube video of his press conference announcing the proposal]. Textbook publishers weren’t vilified at the hearing, but they were taken to the woodshed for their practice of publishing new editions every few years that have minimal changes in content, but move the chapters around enough to make it confusing for students working with earlier versions. For that, they up the price by about 12 percent. California is a backwater for K-12 online learning, according to a new analysis of states’ policies toward virtual education. Other states are clearing away obstacles and adopting innovative strategies, such as allowing middle school students to take high school courses online and letting students start online courses anytime and complete them whenever they show competency. California is stuck in the past, imposing the standard calendar and student-teacher ratios on a virtual world. At least that’s the implication of Digital Learning Now! – a project of the Foundation for Excellence in Education, headed by former Florida Gov. Jeb Bush, and the Alliance for Excellent Education, a nonprofit headed by former Democratic Gov. Bob Wise of West Virginia. California scored at the bottom of the 72-point rubric, which was released at the Foundation’s conference in San Francisco last week. With recent reports out of Colorado and Minnesota showing students in virtual schools significantly underperforming their peers, California can certainly wonder whether it’s smart to rush headlong into this brave new world, as Utah has done. Caution may be the watchword. And some of the many measurements that Digital Learning Now chose are suspect, according to Eric Premack, executive director and founder of the Charter Schools Development Center in Sacramento. But Premack, who has counseled online schools through state regs, has long advocated loosening some of the restrictions limiting expansion and experimentation in online education. These include restrictive student-teacher ratios for online independent study schools and, for blended learning schools that combine online studying and classroom instruction, the imposition of a minimum number of minutes of daily instruction by certificated teachers. The latter rule limits the ability of successful schools, like Rocketship Education, to expand their learning labs beyond a quarter of the day. Premack adds another inhibitor not covered by Digital Learning Now!, the reluctance of the University of California to qualify high school online courses as satisfying A-G requirements for admission to a UC or CSU campus. California was redundantly dinged in the scoring for its requirement that an online operator can only open a school in a county and adjacent counties. While the national for-profit online operator, K12, Inc., has opened enough online charter schools to cover the large population areas in California, not every student in the state has access to online offerings, one of the criteria. The alternative, as in Florida, is for the state to open a statewide online school. Premack argues that California’s geographical requirement encourages innovation. Student Access: All students are digital learners. Barriers to Access: All students have access to high-quality digital learning. Personalized Learning: All students can use digital learning to customize their education. Advancement: All students progress based on demonstrated competency. Quality Content: Digital content and courses are high quality. Quality Instruction: Digital instruction is high quality. Quality Choices: All students have access to multiple high-quality digital providers. Assessment and Accountability: Student learning is the metric for evaluating the quality of content and instruction. Funding: Funding creates incentives for performance, options, and innovation. Infrastructure: Infrastructure supports digital learning. Over the past year, they developed 72 measures of the elements. Go here for California’s scorecard. Some, like a law requiring that all students be equipped with an Internet access device, are aspirational. A few, reflecting Bush’s conservative politics, are ideological: e.g., extending publicly funded digital learning to private school students. And some are innovative, worth experimenting with, such as tying funding for online schools to student performance, the passage of an end-of-year exam. There is nothing in state law to prevent school districts from charging ahead with blended learning, as done by Rocketship and the new Silicon Valley Flex Academy. Bureaucracy and anxiety over the unknown are the chief obstacles. The state also has freed up textbook money to permit districts to purchases digital materials. If anything, the new scorecard should prompt state officials to look around at what other states are beginning to do – and to start to experiment with the good ideas. Note: Digital Learning Now! did not rank the states. But you can do state-by-state comparisons on this interactive map. And Brian Bridges, director of the California Learning Resource Network (CLRN) and a font of knowledge on digital courses, did calculate the states’ individual totals. Out of a possible score of 72, Utah and Wyoming topped the states with 49. The median was 27, he reports in his blog. With 14 points, California was last. You could say that the only folks missing from the National Summit on Education Reform at San Francisco’s Palace Hotel were teachers, but that would be wrong, on a technicality; they were outside protesting. Teachers might have had a vested interest, or even an interesting viewpoint, in the issues raised during the two-day conference. Stuff like tenure, seniority, testing, Common Core standards, and using technology in education. For example, Checker Finn, voice of the conservative Thomas B. Fordham Institute, moderated a panel with Anne Bryant, director of the National Association of School Boards – who playfully quipped that she and Checker disagree about 100 percent of the time – at one end of the dais, and Joel Klein, the former New York City schools chancellor and current Vice President and COO of News Corp’s Education Division, on the other end. News Corp’s main man, Rupert Murdoch, delivers a keynote address today; after all, he recently plopped down $360 million to buy Wireless Generation, a Brooklyn-based education technology and consulting company. You’ll recall that News Corp already knew a bit about wireless technology used in cell phones. But last night, the keynoter was Melinda Gates, and earlier Thursday attendees heard from Sal Khan, the unassuming Silicon Valley genius behind Khan Academy, the nonprofit developer of thousands of high-quality online lessons available free of charge, who joked that he used to think YouTube was for cats playing pianos, not for serious mathematics. Despite their seemingly diverse perspectives, the speakers all do fit together, each bringing a puzzle piece that gives shape to Jeb Bush’s vision of an American education system that’s once again an equal competitor among industrialized nations. “My personal belief is there is no one single thing that needs to get done,” said Bush during his opening remarks. [Read the entire speech here]. What it will require, he said, is a combination of school choice (vouchers), Common Core standards, rigorous assessments, consequences for anything less than excellence, and using technology to transform education. Bush reached out to odd bedfellows to make his case, though. At one point he borrowed from Stanford Professor and teacher advocate Linda Darling-Hammond, describing academic standards in the United States as a “mile wide and an inch deep,” while the rest of the world concentrates on fewer core concepts and teaches them in depth. A few minutes later, when deriding the self-esteem movement, he quoted former Harvard President Larry Summers, whom Bush described as a “kind of politically incorrect guy,” as saying “we need to stop telling kids they need to have self-esteem to achieve and start telling them they need to achieve to get self-esteem.” It was the only line that drew loud applause. It’s also interesting to note that Jeb Bush’s support for Common Core standards is consistent with his view of federalism: Washington can and should play a strong role by setting expectations, but then it had better step aside and let the states decide how to get there. Witty, brilliant, self-effacing, a seeming agnostic in the education wars over school choice and performance pay, Salman Khan is an unlikely revolutionary. But Khan, the former hedge-fund manager turned online tutor, first for his East Coast nieces and nephews and now for the world, is flipping education upside-down. Many teachers and their unions have been too slow to recognize that. Khan’s 2,800 YouTube tutorials on everything from elementary addition to algebra to calculus and physics, are enabling millions of students to excel on their own time, at their own pace, moving ahead only when, by completing 10 problems in a row, they have mastered one discrete lesson at a time. With backing from the Gates Foundation and Silicon Valley benefactors like John and Ann Doerr, his nonprofit Khan Academy has taken the next step. Teachers anywhere can freely use the software he has created in their classrooms and monitor every student’s progress in real time: which video she last watched, how much time she spent, which problem she was stuck on. By using technology to guide students through drills and step-by-step basics – with badges and points to make it fun enough for students to stay plugged in – teachers are liberated to do small group tutorials, help students where they’re stuck, teach concepts, and do project-based learning. Khan was the keynote lunchtime speaker in San Francisco at the “Excellence in Action” national summit on education reform sponsored by former Florida Gov. Jeb Bush’s Foundation for Excellence in Education – a gathering of conservative legislators, free marketers, entrepreneurs, and charter school administrators. The other keynoters were Melinda Gates and, scheduled for this morning, the devil incarnate, Rupert Murdoch, CEO of News Corporation, with his designs for online technology. Bush’s promotion of teacher pay by testing and voucher-like funding of online courses, and Murdoch’s mere presence in the heart of anti-charter, progressive San Francisco spurred a picket Thursday organized by United Educators of San Francisco. Their poster branded them Enemies of Public Education. It made for good theater and another skirmish in a divisive battle over public schools. What the protesters missed, by dismissing the conference and those there as destructive to public schools, were lessons from Khan and John Danner, CEO of Rocketship Education in neighboring Palo Alto. Integrating online learning nearly two hours per day, Rocketship’s five charter schools in San Jose (two opened this year) are producing test results for a student body of largely low-income English learners matching those of wealthy Bay Area neighborhoods. As with Khan’s videos, Rocketship’s online software lets students progress on the basics until they get it. Because of learning labs, Rocketship uses fewer classroom teachers, while funneling the savings to pay them better and train them intensely. Khan’s videos, Rocketship’s learning labs, and the best virtual schools are working for kids. Districts and teachers that resist the potential do so at their peril. When my son was about four years old, we got him a children’s science program for the computer. I put in the disc and ran to the laundry room saying I’d be right back to boot it up. Minutes later I returned to find him sitting at the desk, legs dangling a foot off the ground, as he happily clicked the mouse and sorted animals into piles of mammals, reptiles, birds, and slimy things. Unfortunately, when he started school, technology pretty much stayed behind at home. “I’ve been trying to think of a metaphor for education today. We’ve got one foot in this thing,” said Trilling as he showed a slide of a rusted metal rowboat. “And the other foot is in this boat,” he said as another photo appeared of an ultra-modern rowboat with solar panels and carbon fiber construction. Trilling has been advocating for better integration of technology in schools for a few decades. He was director of the Technology In Education group at WestEd, an education research group; global director of the Oracle Education Foundation; co-author, with Charles Fadel, of the book, 21st Century Skills: Learning for Life in Our Times. He is currently a consultant to the Hewlett Foundation’s Deeper Learning Schools network, a group of schools and education programs that use technology in project-based learning and differentiated instruction. 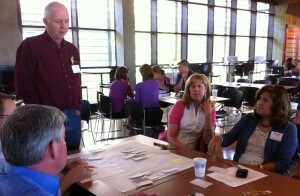 He led the ShiftEd participants through a series of exercises designed to get them thinking about what students need to learn today in order to be successful in a rapidly changing economy. Their responses were candid, practical, and a bit scary. 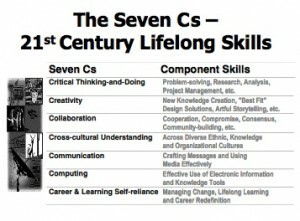 What skills will your child need to be successful in that world? “Understand and value different perspectives,” “know how to collaborate with diverse people,” and be able to distinguish between the wheat and the chaff coming at them from so many electronic information sources. Learning in and of itself will be the most critical skill of all, said Trilling. As the world shifts into a more global economy and jobs continue to move offshore, what today’s students really need to know is how to be lifelong learners. That middle-class job with a pension, benefits, and an eight-hour workday – fuggedaboutit. So, to the three Rs, Trilling adds the seven Cs: Critical thinking and doing, creativity, collaboration, cross-cultural understanding, communication, computing, and career and learning self-reliance. It takes more than simple addition to connect all those skills. Sandra McGonagle, principal of Santa Rita Elementary School in Los Altos, came to the workshop with her tech specialist and said the first thing she plans to do when school starts in less than two weeks is hold a staff meeting on the need to teach 21st century skills. She acknowledges, however, that while the school has a lot of equipment, teachers aren’t at the same level of know-how when it comes to integrating technology into classroom learning. But the state budget cuts have made it nearly impossible to release teachers from classes for additional training because the school has no money for substitutes. “I need time. I need the time more than anything. That’s the challenge,” said McGonagle. Trilling hears this a lot. Schools need more professional development. In addition to a lack of time, the supply of coaches can’t seem to keep up with the demand. Coaches are crucial not just for technical training, but also for creating a cultural transformation in schools. Schools need experts on the ground working with them to make that happen. After the presentation, I asked Trilling what gives him hope in the midst of budget cuts, shorter school years, teacher layoffs, and low morale. He said it’s seeing the innovation and leadership going on in so many places around the country. The schools in the Deeper Learning network, along with hundreds of others that Trilling has visited, are models that show it’s possible to be innovative, engaging and to teach students the technical and life skills they’ll need to know to find jobs and participate in civic life, while also preparing them to score well on standardized achievement tests. Trilling sees this happening even as the U.S. Department of Education continues the previous administration’s policies of more testing, shutting down or gutting low-performing schools and holding teachers primarily responsible for their students’ test scores. * The Silicon Valley Education Foundation is the nonprofit, non partisan administrator of TOP-Ed’s grants.